New Japan Pro Wrestling set the stage for Saturday's New Beginning in Osaka with two nights of televised action from the Road to the New Beginning tour on Monday and Tuesday in Tokyo's Korakuen Hall. The most notable bout from the two shows was the IWGP Tag Team Championship defense by SANADA & EVIL, as they retained their titles over Kazuchika Okada & Hirooki Goto. 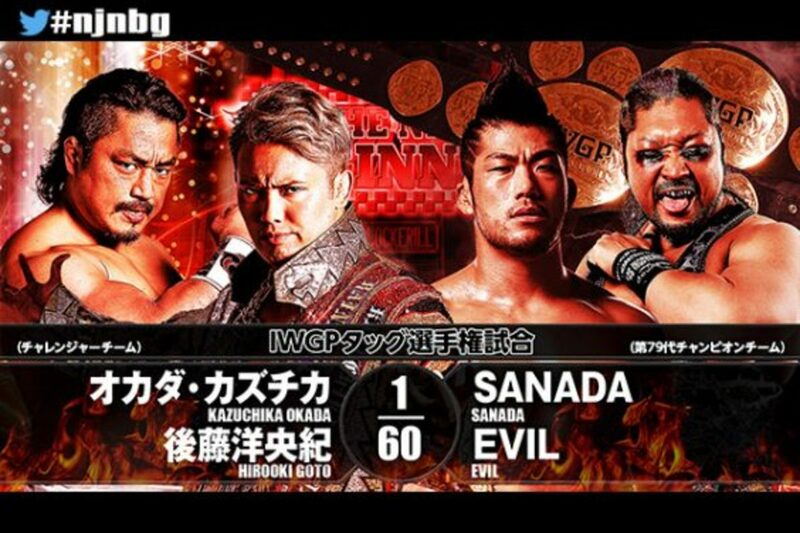 SANADA is Okada's opponent on Saturday, and his title defense here should lend him some credibility and momentum, as he enters what could be the biggest match of his life. EVIL is also set to challenge for Goto's NEVER Openweight Championship in Osaka. Liger and Tiger worked over Narita's left leg, and Narita's selling looked good. Tiger went to work on Yagi's left arm, and Yagi actually got some offense in, firing back with chops. Taguchi put a stop to that, forcing a tag to Umino. Umino got a near fall and a near submission on Taguchi, but Liger made the save. Taguchi got the pin with the Dodon after surviving a La Magistral cradle. This was fine -- a typical veterans vs. young boys tag match. A short, thoroughly unexceptional bout. Hikuleo is the former Leo Tonga. The Bullet Club team established themselves as heels, breaking rules and jumping Oka at the bell. They brawled to the floor. Oka was dominated, but he was able to tag Nakanishi. Nakanishi scored with some chops and tipped control of the match to his team. The big man tagged Oka back in, which proved to be an error in judgment. Oka ate a DDT from Takahashi and was pinned. This was a challenge, as Tenzan is clearly beaten up and having trouble moving. They had a slow match, with Tenzan taking the bulk of the offense. Kitamura showed heart in surviving through some near falls, but he eventually tapped to the Anaconda Vice. This was solid. Suzuki-gun turned it into a brawl, which served as the great strength of the match, as it highlighted Sho and Yoh's selling, which is the strongest part of their game. Sho's back was taped up and Michinoku targeted it. The match broke down into a six-way. Romero and Desperado took the ref, before Romero hit a tope to the outside, wiping out Taichi and Desperado. Sho and Yoh hit their finish on Michinoku for the win. The crowd was solidly behind Robinson. Ishii no-sold most of Henare's offense in the early going, lending more credibility to his selling of the youngster's offense late in the match. Ishii is really a brilliant worker. They did some of the standard Yano comedy spots, including removing the turnbuckle pad, which the referee didn't even bother to chastise him for. Towards the finish, as Ishii started to sell and the contest became more back and forth, Yano tied Robinson to the barricade by his hair, leaving Henare to go it alone. Ishii hit the brainbuster and picked up the pinfall. Suzuki-gun pounced before the bell rang. Stop me if you've heard this one, but they brawled around ringside. Makabe and Elgin fought off Suzuki and Iizuka, and the brawl was kept short, as KUSHIDA and Kanemaru went at it in the ring. The brawling picked up again, and Suzuki and Iizuka brawled into the crowd with Elgin and Makabe. Desperado joined in the brawl and helped Suzuki-gun waylay KUSHIDA, and the brawlers took over. KUSHIDA sold for a while, before tagging Elgin in, allowing the big man to do his power stuff, which always gets over. Suzuki and Makabe squared off and exchanged forearm strikes, which got a big reaction. Suzuki slapped on a sleeper, missed the Gotch piledriver, and slapped on another sleeper in a cool spot. KUSHIDA made the save as Iizuka went for the iron glove. The finish saw Makabe hit the top rope knee drop on Kanemaru for the victory. After the match, Makabe challenged Suzuki for an Intercontinental title match, and Suzuki snapped, attacking the young boys at ringside. I recall an interview with William Regal where he was talking about an unnamed prospect that WWE was interested in, believed to be Adam Cole, who they had passed on because he looked too young to be taken seriously as a tough guy. I think of that every time I see Jay White in action. His character is supposed to be this ruthless killer type, but he looks too young for me to take him seriously as a grizzled, deranged madman. The work here was quite good, highlighted by a state-of-the-art opening exchange. They brawled to the outside, and White took over after hitting a suplex on the floor. White worked over the legs and the injured shoulder of Finlay. White suplexed Finlay over the top to the outside, which was nuts. White swung a chair at Finlay, who ducked and hit a spear for a near fall. Finlay opted not to use the chair when he had the chance, which the crowd applauded him for. Finlay hit a Lumbar Check for a near fall. Finlay went for his cutter, but White reversed into the Blade Runner for the pin. They didn't get a ton of time, but they did well with what they had. White punished Finlay with elbows after the match. This was a unique match, as eliminations could take place via pinfall, submission, disqualification, or over the top rope, Royal Rumble-style. Takahashi eliminated himself going for a sunset flip from the ring to the floor on Ospreay, who was eliminated as the move was executed. YOSHI-HASHI eliminated Naito over the top rope. Gedo was disqualified for removing BUSHI's mask. YOSHI-HASHI tossed BUSHI, leaving CHAOS with a 3-2 advantage. Okada and SANADA had a nice back and forth, teasing their upcoming title match and ending with Okada eliminating SANADA over the top. EVIL dumped Okada immediately after, making it 2-1 for CHAOS. EVIL tossed Goto, leaving it a 1-on-1 between EVIL and YOSHI-HASHI. YOSHI-HASHI kicked out of the Darkness Falls, and scored a near fall with a powerbomb, before falling victim to Everything is EVIL for the pin, and a victory for LIJ. They used the same template as the young boys opener the previous night, with Liger dominating and the boys getting some offense in on his partners. Narita did a fair bit of damage to KUSHIDA by employing a modified Sharpshooter and a Boston Crab, but he eventually tapped to the cross armbreaker. The work was not particularly smooth here when Hikuleo and Oka were in together, but Hikuleo in particular has improved greatly in the last few months. This was short, but they did more near falls than you would expect from the second match on the card. Takahashi pinned Oka after a DDT. This was the fifth match in the seven match trial series that is supposed to be getting Kitamura over, I suppose? I understand the principle, but I'm not certain that it's working as designed. Nakanishi is much better off in tags these days, but this was short enough and simple enough that he looked fine. They exchanged power moves, chops, shoulder blocks, and the like, and brawled outside. Kitamura hit the spear, but he couldn't get Nakanishi up for the Jackhammer, and fell victim to a lariat. Nakanishi hit a double sledge to the chest for a near fall, and racked Kitamura for the submission. Roppongi 3K took the advantage early, but Suzuki-gun turned it into their standard crowd brawl, working over Sho's injured back and gaining the edge. With Sho selling on the apron, Yoh worked the bulk of the match, selling for Suzuki-gun. Romero got a hot tag and used an eye rake and a backslide on Michinoku for the pin. Suzuki-gun beat down Roppongi 3K after the match. Yano aimed to tie Robinson to the top rope by his hair, following up on their match from Monday, but failed. Robinson and Yano did some comedy. Ishii and Henare worked together again, and Ishii sold more early on than he did the previous night. Again, so smart. White hit the Blade Runner on Henare, and followed up with elbows, taunting Finlay. With Henare taking punishment, the ref called for a stoppage. Suzuki and Makabe brawled through the crowd and to the backstage area, furthering their angle, as they teased the idea that Makabe is going to try to force Suzuki to accept his IC title challenge. Iizuka and Taguchi did some comedy, then Elgin tagged in for his power stuff. Suzuki and Makabe tagged in and exchanged strikes, and Makabe survived a sleeper attempt and tagged out. Suzuki continued working on Makabe even though he was no longer the legal man, and he used a sick hangman's choke. Taguchi was legal, and tapped to a Suzuki heel hook. Suzuki-gun ran wild after the match, laying out Elgin and Taguchi. Suzuki provided the exclamation point, hitting Makabe with the Gotch piledriver. Suzuki grabbed a microphone and cut a promo, refusing Makabe's challenge. It may be too early to second-guess the booking decision not to put the IWGP title on Naito at Wrestle Kingdom, but at this point, it certainly feels like Naito has lost a bit of his luster since falling short there. The LIJ team worked over YOSHI-HASHI, perhaps punishing him for eliminating so much of their team in the main event on Monday. Ospreay tagged in and exhibited why he is my favorite high flyer in the business today. He and Takahashi did some cutting-edge stuff together, then Gedo and BUSHI tagged in and slowed things down. YOSHI-HASHI hit a lariat and hit Karma for the win. YOSHI-HASHI attacked Naito after the bout, setting up their match on Saturday. There were dueling chants for Okada and SANADA, who started the match. They began slowly, working holds. SANADA went for the Paradise Lock, but Okada kicked out and tagged in Goto. SANADA and EVIL took the action outside, and EVIL guillotined Goto against the post with a chair. EVIL and SANADA worked over Goto back in the ring, and they continued to go at a slow pace. Goto hit a desperation lariat, then made the tag to Okada. EVIL tagged SANADA, who tossed Okada outside and hit a plancha on the IWGP Heavyweight Champion. Okada fought back and briefly locked in the Cobra Clutch, which Okada is still struggling to get over as a potential finisher. Goto got a tag and applied a sleeper. He teased a GTR, but EVIL made the save. Okada jumped in and hit his dropkick on EVIL, and all four men ended up down in the ring, selling. Okada broke up a Magic Killer and Goto and Okada hit duel Ushigoroshis, in a cool spot. EVIL reversed a GTR attempt, hitting a fisherman's suplex and Darkness Falls for a near fall on Goto. Okada broke up a pinfall, but SANADA jumped in and nailed Okada with a Rainmaker. With Okada down, EVIL and SANADA hit a Magic Killer on Goto. EVIL hit Everything is EVIL on Goto for the pin, retaining the titles. SANADA cut a promo after the match, promising to take Okada's title on Saturday in Osaka.